The Modern Range of Log Cabins from Tack, one of Europe's leading manufacturers of timber garden buildings. This range offers innovative and contemporary buildings which can be designed to suit your requirements. Numerous door and window options are available which can transform the look of the building. 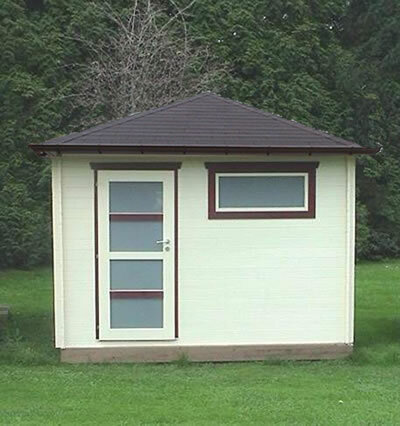 Double glazing and insulation packages are also available to help turn your log cabin into a garden studio or office. Several wood thicknesses are available up to 90mm (3.6"). These buildings are listed as an example of what can be accomplished from over 20,000 different possible combinations. This log cabin features a single door and a bottom hinged frosted window. 9'2"x6'7". A flat roof log cabin, featuring a single solid door. Measuring 3 x 2m. A flat roof log cabin, featuring a single solid door. Measuring 3.5 x 2m. A flat roof log cabin, featuring a single solid door. Measuring 4 x 3m. The Tokyo D flat roof log cabin featuring double sliding doors. Measuring 9'10"x6'7" but with many larger sizes available. A flat roof log cabin in 45mm logs featuring double sliding doors. Measuring 9'10"x6'7" but with many larger sizes available.